I’m laptopping you from the South Rim of the Grand Canyon, at the top of a snowy track descending 4,380 feet to the Colorado River. Papery flakes float down from an infinite, domed sky into a bottomless pink bowl — all visible through the picture window of a small wood-framed studio jutting out from the rock-edge. 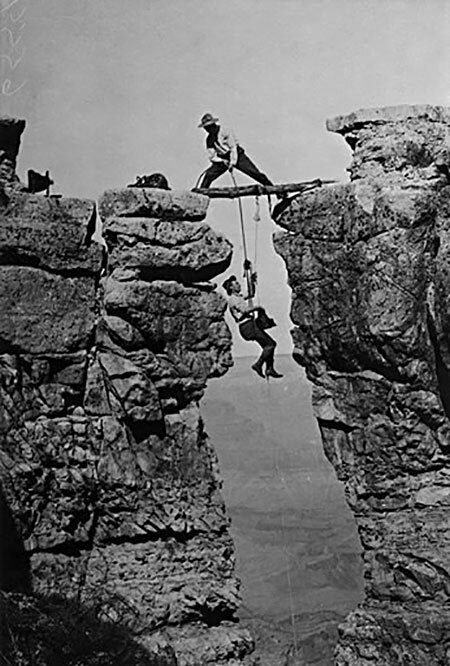 A 36-minute DVD called, Kolb Brothers: Grand Canyon Pioneers (The Arizona Collection), lets the brothers’ story unfold through their photographs and movie. 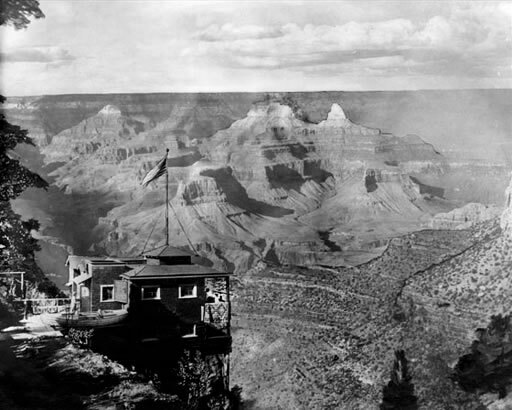 In 1901 twenty-five year-old Ellsworth Kolb came to the Grand Canyon from Pennsylvania to work as a bellboy in the Bright Angel Hotel. His younger brother Emery was in nearby Williams, Arizona purchasing a photography business for $425. Emery promptly moved the new venture to the Canyon where he and Ellsworth set up a tent to sell photo souvenirs. Initially they worked on a dirt floor in an abandoned mineshaft and used muddy water from nearby cow ponds for developing. Well-to-do tourists paid a hefty sum of $1 to ride a mule in and out of the canyon on an old Havasupai Indian track, now called the Bright Angel Trail. 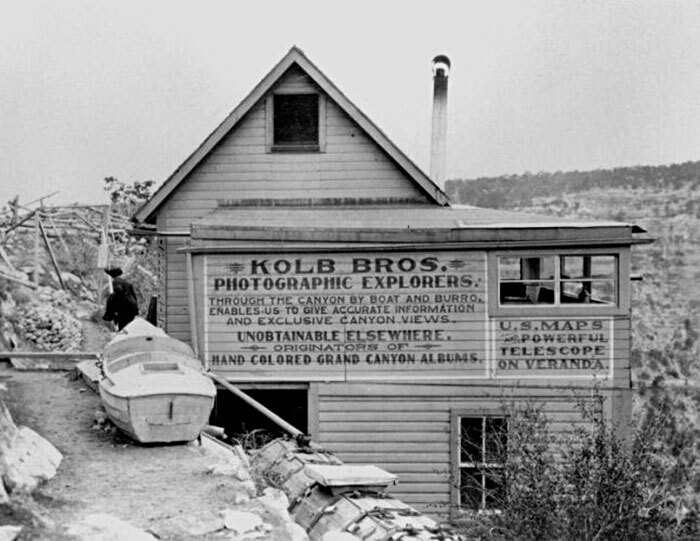 With their business hopping, the Kolbs soon leased an old mining claim at the head of the trail and blasted into the rim to build a permanent photography studio. Nestled into the rock, the studio had no electricity, no running water — a picture window overlooked trail and canyon. Next they constructed a darkroom four and a half miles down the trail at Indian Garden — a spot with a fresh water spring they could use for developing. Ellsworth shot the mule-riding parties from the studio window, and then Emery would run the film down the trail to the darkroom. 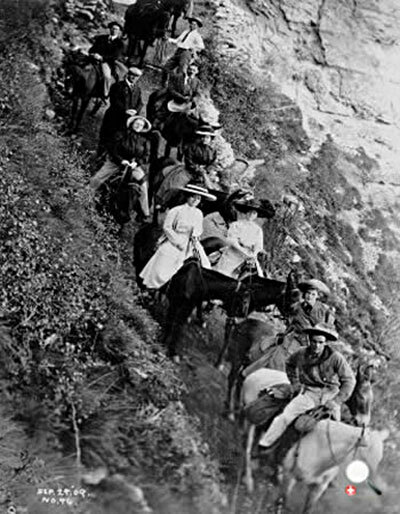 Before the riders could make it back up the trail after their sojourn, Emery had already returned to the studio with their developed photos. Within a few years Ellsworth and Emery had hiked the inner canyon and documented its secrets. They retraced and filmed the treks of the early surveyors. They rowed and paddled two wooden boats through 11,000 miles of white water and were the first to film it. They even built onto their studio a theatre and projection room so they could show their new picture. In seven decades, over three million visitors were photographed from the Kolb studio. Emery continued to present their film there every day until his death in 1976. Esoterica: Twenty years ago Dad and I, with a handful of other heat and thirst enthusiasts, hiked the Grand Canyon from rim to rim. I still remember, at the end of the day’s descent, the icy rapids of the Colorado swirling around our hot ankles. At sunset Dad insisted on taking his sleeping bag to the water’s edge, where he could lie down on the shaly limestone and sleep under the cosmos. A few moments after dusk an unidentifiable sound began — here and there at first, then steady and crescendoing to a deafening roar. Soon Dad was crawling into the tent. “There are 17 million frogs fornicating on my sleeping bag,” he said. We zipped up, leaving the stars to the lovers. This September will host the 7th annual Grand Canyon Celebration of Art, which invites artists worldwide to gather here to paint the Canyon. The results are exhibited annually at the Kolb Studio. I’m looking at last year’s efforts, and taking in the view. The next workshop is being held at Ghost Ranch, Abiquiu, New Mexico from October 4th to October 10th, 2015.